Spring Sale – 11th May! 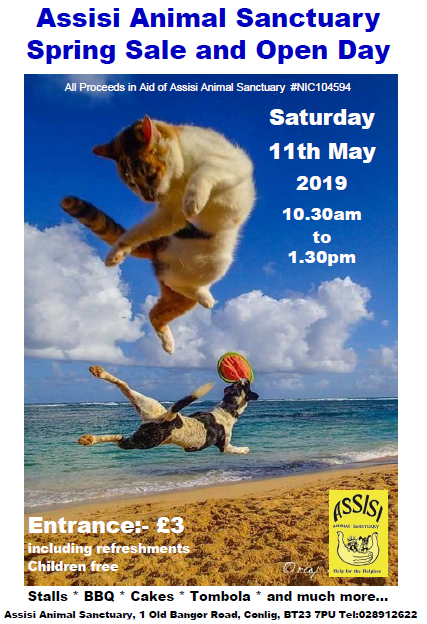 Assisi Animal Sanctuary Spring Sale and Open Day will take place on Saturday 11th May 2019, 10:30am-1:30pm! Join us and browse the stalls and goods on offer, and enjoy the BBQ, cakes and tombola – and more! Entrance is £3 per adult (refreshments included) and free entry for children. All proceeds in aid of Assisi Animal Sanctuary.